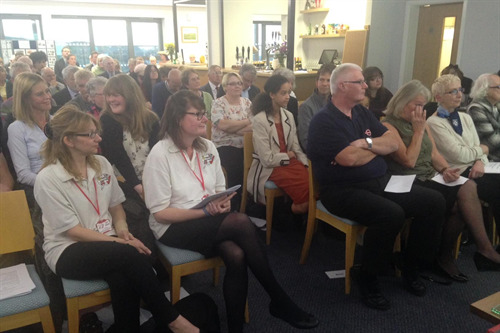 Seaford Town Council was pleased to be able to host the Annual Town Meeting at the new Seaford Head Golf Clubhouse and was thrilled to see in excess of 90 members of public attend to take part in the meeting. The meeting started with a presentation from Town Clerk to the Council, James Corrigan, presenting the new revamped 2014/15 Annual Report, which is now available from the Council Offices, its website www.seafordtowncouncil.gov.uk or by emailing admin@seafordtowncouncil.gov.uk, he gave an overview on exactly what the Town Council does for the town. 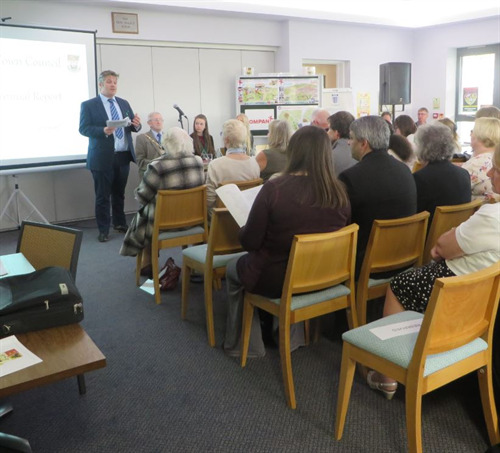 The presentation was well received and the Annual Report will serve as a useful information point for residents, Councillors and staff alike. Mr Corrigan continued with the eagerly anticipated announcement regarding the chosen contractor for the play area in the Salts Recreation Ground further to the public consultation that was held earlier this month. The Council was delighted to announce that Kompan were the public’s favoured contractor and that it is hoped the play area will be in situ in time for the Summer holidays. A press statement with further details on the design, contractor and plan going forwards is to be released separately. As in previous years, the Council had invited the recipients of financial grants awarded by the Council in the 2014/15 financial year to attend the event. Displays were in place from some of the small grant recipients (under £500); Cuckmere Community Bus Ltd, East Blatchington Pond Conservation Society, Mercread Youth Centre, Seaford Museum & Heritage Society, Seaford Seniors Forum, Seaford Stroke & Caring Club, Seaford Twinning Association, Waves Seaford Ltd and the Squadron Air Cadets 1218 (Newhaven). The recipients of the large grants (£500 and over) were invited to make presentations at the meeting, with very informative and inspiring appearances from Seaford Bonfire Society, Seaford Community Partnership, Seaford Lifeguards, Seaford Musical Theatre & SMT Juniors, Seaford Rugby Football Club and Seaford Town Football Club. The Mayor’s two charities, Waves and Seahaven Storehouse, also gave heart-warming and thought provoking presentations on the vital work that they do for the families and residents of the town. 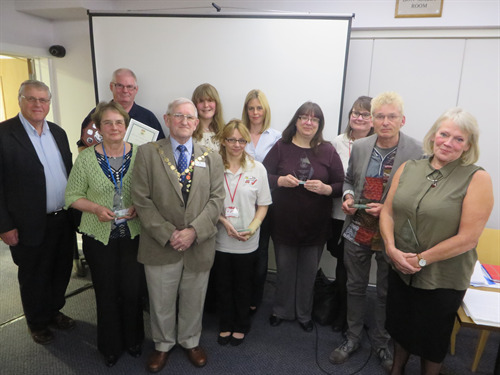 The meeting finished on a high with the presentation of the Mayor’s Awards, for individuals and organisations that have helped support and enrich the town and its residents or have inspired others with their personal stories and accomplishments. The awardees were Isabel Trenfield (overcoming adversity), Charlotte Woodgate (overcoming disability and charity work), Paula Woolven (services to young people through the theatre), Jenny Thornton (level of customer service and improvements at Seaford train station), Geoff Stonebanks (promoting Seaford through his open garden and charity fundraising), Think School Travel (working for the safety of our school children), Waves (helping disadvantaged families) and Seahaven Storehouse (providing food resources and support to disadvantaged residents and families of Seaford). 2015 is the second year of the prestigious Don Mabey MBE Award; awarded to individuals who have gone above and beyond with their services to the town and its residents. 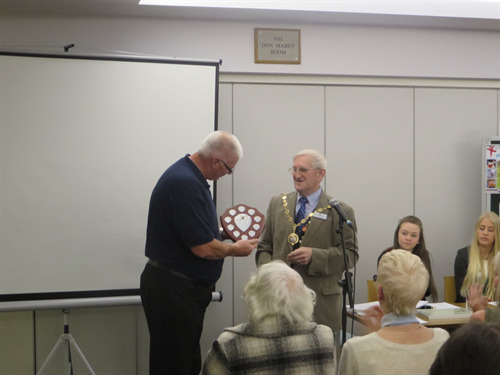 This year this honour was awarded to Peter Gwillam who among many other voluntary duties and services has been Chairman of Seaford Lifeguards for over 15 years, helping to ensure the safety of the town’s residents and visitors; a truly admirable voluntary service. Upon receiving the award Peter said ‘I will accept this on behalf of all the team’ a true reflection of his inspiring attitude and humbleness. Seaford Town Council would like to thank Sussex Events Ltd for the use of its PA system for the event and would also like to offer apologies to Seaford Lifeguards for the technical issues resulting in them being unable to show their presentation video. Arrangements are being made for the video to be uploaded to the internet so it can be viewed online by any members of public wishing to do so. The link to the video will be shared once created. For details on any of the Town Council’s events, meetings or services please visit its website at www.seafordtowncouncil.gov.uk or follow its Facebook and Twitter pages.